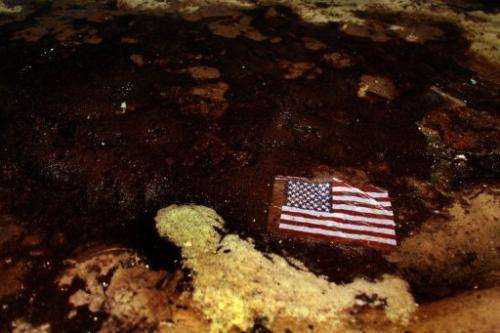 An American flag lays in a slick of oil that washed ashore from the Deepwater Horizon oil spill in the Gulf of Mexico on July 4, 2010 in Gulf Shores, Alabama. The United States hit drilling rig operator Transocean Deepwater with $1.4 billion in criminal and civil fines Thursday for its role in the 2010 Deepwater Horizon oil leak disaster in the Gulf of Mexico. The United States hit drilling rig operator Transocean Deepwater with $1.4 billion in criminal and civil fines Thursday for its role in the 2010 Deepwater Horizon oil leak disaster in the Gulf of Mexico. Transocean agreed to plead guilty to violating the Clean Water Act in the disaster, in which a blowout on the drilling rig killed 11 and sent some 4.9 million barrels of oil into the Gulf, the Justice Department announced.